If you've ever wanted to never drive your coworkers to lunch again, just buy this 1983 Dodge Ram Van Clockwork Orange Theme here on eBay bidding for $8,700 with 2 days to go, located in Ft Myers, FL. This van is as cool as it gets, and will get you more trophies, photo tags, fans, and action than anything else with wheels and a motor! 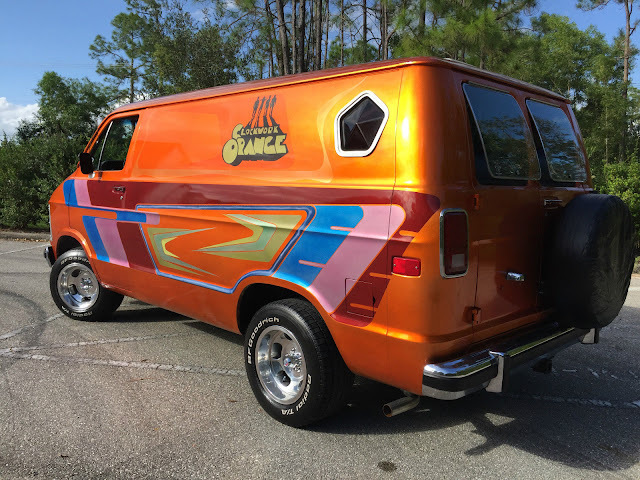 The van was purchased brand new on March 1ST, 1983 in Knoxville, TN with just 12 miles on the odometer, based upon the original owner&rsquo;s detailed and well-kept records. Looking through the logbook, you can see that it travelled between Tennessee, Texas, Nevada, Arizona, and more on a regular basis up until he sold the van to a friend on 11/22/1995 with 74,314 miles on the clock. The log book is cool, because it not only shows every gas stop, oil change, and service stop the van had done, but the date, mileage at the time, and cost of gasoline per gallon too!!!! The 2nd owner carefully maintained the vehicle, and only drove it throughout Tennessee and Georgia as a weekend show car before it found its way to the 3rd owner in Florida with 89,985 miles back in 2001. Again, the van was used primarily for local shows and cruising, but did see a number interstate road trips back to California, and across the southern United States. Now, with just over 108K miles showing on the odometer, the van is ready for a new owner, and more new experiences. It is SUPER CLEAN, and rust-free throughout, thanks to a lifetime spent in mostly Southern States, and winter storage. The frame, chassis, and undercarriage are solid, clean, and rust free BARE METAL, with no heavy rust proofing or other sprays to hide anything. Yes, the bolts and exposed metal show oxidation like they should, but it is rock-solid, and 100% rot and rust free underneath. 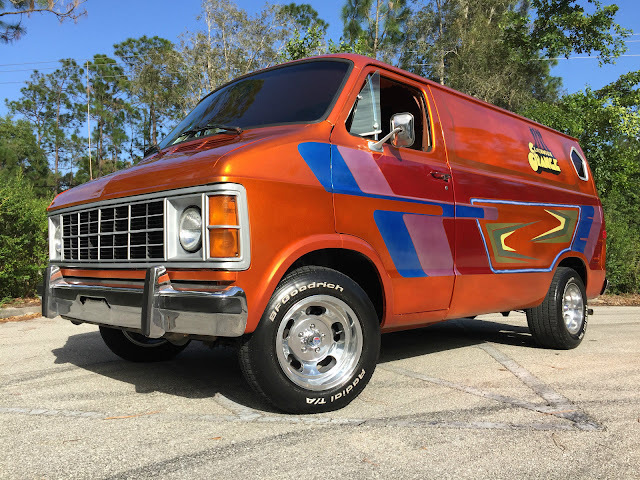 The van has a brand new stainless steel exhaust system with muffler, and has been completely serviced with a fluid change, brake system refresh, transmission service, new valve seals, A/C conversion to R134A, suspension system check and alignment, and rear end service less than 1,000 miles ago. It is ready to go wherever you want to take it. The van wears all of its original body panels, and they are 100% steel and in exceptional rust-free condition. Body is super straight, and there are NO bondo, patch, or prior repair marks anywhere on the van body. 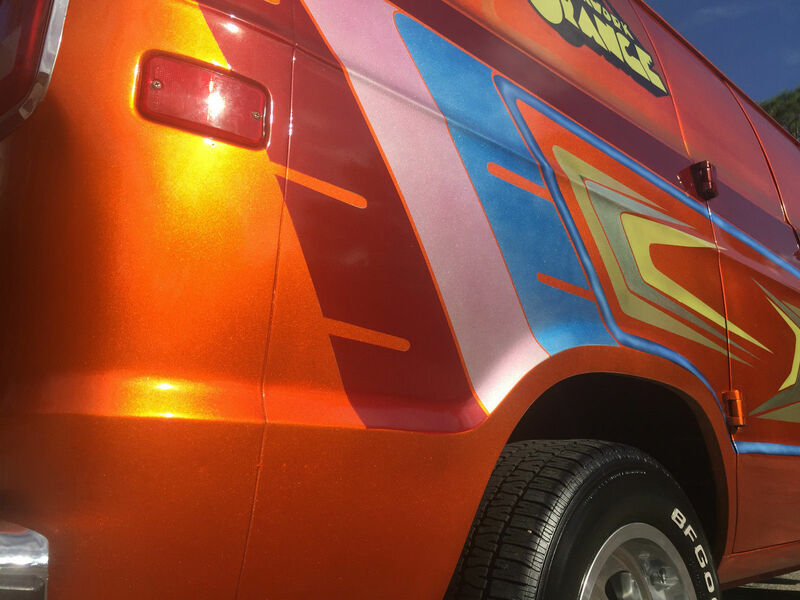 The amazing candy pearl finish on the van is something you have to see in person to really appreciate! It looks AMAZING, and shows as cool from 2 feet away as it does from 20! The orange sunburst main color provides a perfect backdrop for the wild combination of psychedelic panels, air brushing, and the CLOCKWORK ORANGE logo on the sides. There are less than a handful or so truly minor marks and imperfections to be found on the exterior of the van, like stone chips, little scuffs, and things like that. It probably shows better than most 1 year old cars at your local new car store, and has been INCREDIBLY well-cared for since new, even though it was actually driven. Factory pinch welds are still evident all around the van, and when you start looking under the fenders, inside the doors, and everywhere else, you only find clean, RUST FREE parts. Glass is clean, shows no chips, cracks, or damage, and the vent and rear pop-out windows open, close, and latch as they should. Rare, and original Chrysler PENTASTAR rear portal windows look killer, as do the original side mirrors, and chrome front and rear bumpers. The grille shows like new, and all of the lights and signal lenses in it work perfectly too. NOS wiper arms work perfectly, and all of the weather seals, window stripping, and door seals were replaced just a few years back so they keep everything dry and clean inside. The original wire wheels that were on the van had light oxidation on them, so we installed a BRAND NEW SET of show-polished U.S. WHEEL INDY 5-slot rims, which are perfect in condition, and are wrapped in BFGoodrich Radial T/A tires with raised white letters all around. A rear mount spare tire carrier works as it should, and has a vinyl tire cover for a cleaner look, and a REESE type box hitch is suitable for towing your small trailer anywhere in the Country! On the roof, a few modest little dents that no one would ever see exist from parking under trees every now and then, but the paint and presentation look excellent for the most part. The roof vent is function, weather tight, and works like it should too. Pop open the hood, and you will find an exceptionally clean engine bay! All factory components were used to maintain it and do upkeep over the years, so it still retains a full stock appearance throughout. Even most of the original factory decals are still intact!!! Radiator was replaced about 3 years ago with a NOS unit, and when we went to convert the air conditioning system to R134A, we decided to go with a brand new compressor and other components to make sure it got ICE COLD, which it does. Everything under the hood functions as it was intended, and there are currently no known mechanical, electrical, or functional issues with the van. The original 3.7L 225CI slant 6 engine in the truck performs and runs EXCEPTIONALLY well, thanks to the fantastic history of maintenance and care it has been given by the three prior owners. It starts right up with a twist of the key, idles cleanly, and makes no smoke or noise. It is actually almost hard to tell that it is running because it is so quite. Snick the manual 4-speed overdrive into gear with the crazy yellow shift ball, and the van is ready to roll. It is a BLAST to drive, and handles and feels like a year old vehicle when you are driving it! 70mph on the freeway? Yep. Just sit back and guide her down the road. It hangs with traffic all day, and turns in pretty good fuel-economy too! Stuck in traffic for an hour heading to the beach? Yep. I have that t-shirt too. It took us 40 minutes to make a 3 mile crawl down to the island, and the van did not do ONE FUNNY THING the entire time, with the A/C on full blast inching along at idle. Take it to the beach, the local cruise night, or even a Target parking lot and you could make $500 a day charging people who want to take a picture with it! 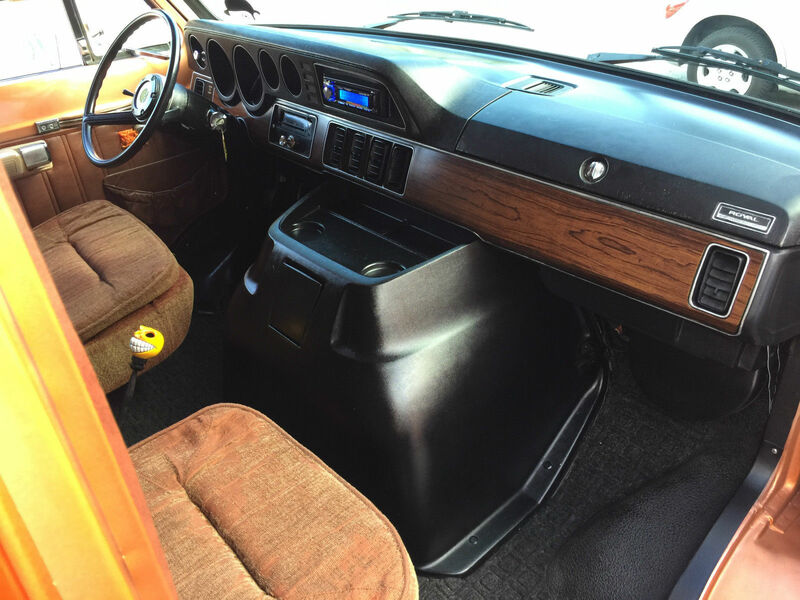 Power steering and power disc/drum brakes are all dialed in to work perfectly, and the van drives and handles without any odd slop or unsteadiness, while the brakes slow you down without any wobble, excess fade, or modulation. It really is like driving a few year old van. Headlamps, hi beams, tail lights, parking lights, hazard lights, and turn signals work as they should, as does the back-up light. IF YOU COME AND DRIVE IT, YOU WILL BUY IT. That sums it up. It is about as clean running and good driving as you can get. A/C is converted over to R134A and blows ICY COLD from all the vents, and the heater and defrost slides work too. Open the doors, and you realize that this is where the magic happened! 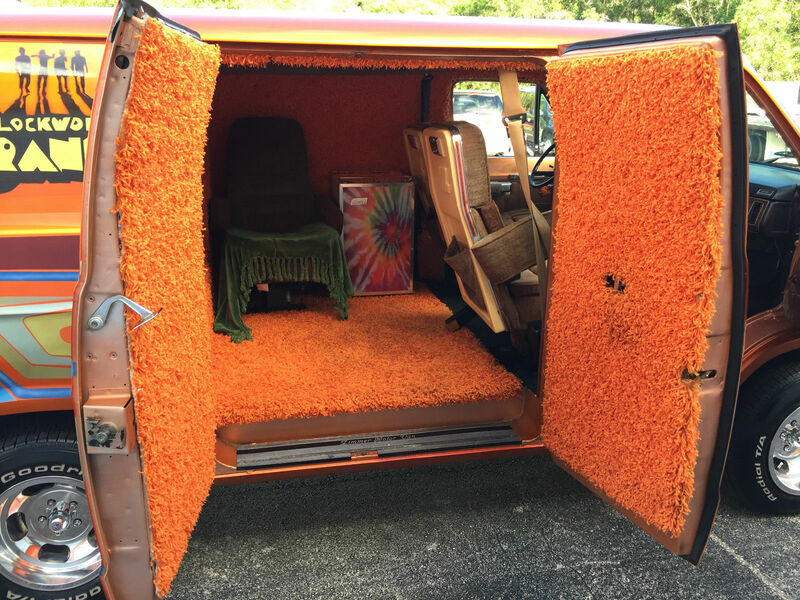 Floor to ceiling orange shag carpeting is in exceptional condition, and covers everything on the inside of the van except the engine cover, dash, and factory front seat floor covering. Dash is factory original, and shows incredibly well after 33 years, with NO cracks, NO damage, and NO disrepair anywhere on it. Glove box locks/unlocks and opens like it should, and holds the fuse box with a variety of spares passed along by the prior owners. All of the A/C vents work like they should, and stay where you aim them. Engine cover is clean and issue free, and has indents for a cup holder and segmented storage, along with a working, but never used, ashtray. Heat and A/C control panel looks great and operates as it should, and all of the factory gauges and warning lights work like they should as well, including speedometer, odometer, fuel and temp gauges, and oil and volt gauges. Brake warning light works with E-Brake, and the generator and other start-up lights in the dash work too. Even the key buzzer works, and it beautifully annoying. 12V outlet with cigar lighter works like it should, and so do the headlight switch, wiper switch, signal arm, and horn button. Factory pedals are intact with the exception of the gas pedal, which is a bare-foot style popular in the 1970s. Factory front waffle type carpeting is in excellent condition, and shows only the lightest signs of use. Inside hood release works like it should, as does the emergency brake. A brand new XDM270 AM/FM/WMA/MP3/USB/CD/iPod head unit was installed, and it sounds AMAZING through the various speakers tucked throughout the van! As an added bonus, a CD of the original A CLOCKWORK ORANGE soundtrack COMES WITH the van, so you can blast the included CD of the A CLOCKWORK ORANGE Movie Soundtrack while out cruising in search of the old Ultraviolence. Period correct map lights are in place, as are a full mirrored ceiling! The original ZIMMER VAN captain chairs upfront are in exceptional condition, with only light signs of wear and use, and full functionality including the dual folding armrests on each, rear mounted storage pouches, and rear mounted ashtrays. The 3rd seat in the back of the van is the original driver bucket seat, and does have wear and tear, so it was swapped with the original rear seat up front a few years ago. It is included, and fully functional, but it is NOT currently bolted down to the floor. A COLEMAN mini fridge is decked out with a psychedelic paint scheme and matching orange shag, and the front seats have functional seatbelts with shoulder harnesses. Rear segment is separated by a padded and shag covered wall with more speakers and a spade cut out allowing access to the bedroom. The custom made rear box has storage underneath accessed by the covered rear panel, and is topped with an inflatable air mattress with the most garish leopard print cover and sheets you could ask for! Blue, purple, and pink shag pillows are tossed about for relaxing on, and the terry rear window curtains prohibit passerby from peering in at the activities inside. All of the side and front doors open and close as they should, and are treated to shag covered panels all around. Inner doors, under the doors, and hinge areas, and the attachment points to the body all look and show wonderfully, with no issues, rust, or rot. Overall, the van is an exceptionally clean, incredibly well-maintained, and fantastic running machine that snaps necks like a chicken farmer when you drive past! Take it to a show and everyone flips out!!!! You NEVER see cool vans these days, and to find one so original, clean, and eclectic as this one really gets the show car crowd worked up! Prepare for someone to want to take a picture of it EVERY DAY. Prepare for people to ask to see inside it EVERY DAY. It is pretty much the coolest thing on 4 wheels, and needs absolutely NOTHING to drive and enjoy it right now. I would not hesitate to fly in to Ft Myers and drive this thing home anywhere in the Continental U.S. or Canada. It would be an epic road trip, and the van has more than proven its reliability and long-haul capabilities. I'm waiting for a Cannibal Holocaust themed Land Rover. My kid goes to grade school with malcolm mcdowell's son. I should buy this and have him sign it. Holy smokes, if you don't ... I will! The pentastar window is a cool touch. So is the model.